Fluorescence Microscopes - New York Microscope Co.Fluorescence Microscopes - New York Microscope Co.
A fluorescence microscope is used to study organic and inorganic samples. Fluorescence microscopy uses fluorescence and phosphorescence to examine the structural organization, spatial distribution of samples. It is particularly used to study samples that are complex and cannot be examined under conventional transmitted-light microscope. Fluorescence microscopy images helps to study substances present in low concentrations where high-sensitivity is crucial to detect them. 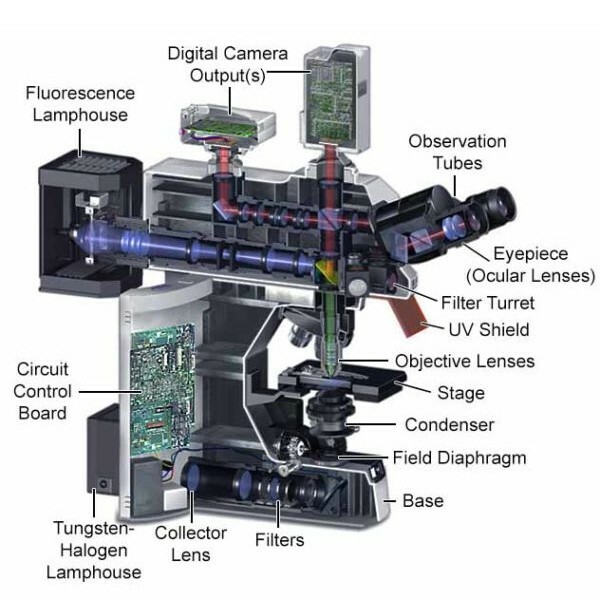 The main parts of a fluorescent microscope overlap with the traditional light microscope. However, there are two main features that sets fluorescent microscope apart from the traditional microscope. One is the type of light source and the other is the use of specialized filter elements. A fluorescence microscope uses a higher intensity light to illuminate the samples. A powerful light source (xenon or mercury arch lamp): The light emitted from the mercury arc lamp is 10-100 times brighter than most incandescent lamps and provides light in a wide range of wavelengths, from ultra-violet to the infrared. Excitation filter: The purpose of the excitation filter is to filter out all wavelengths of the light source, except for the excitation range of the fluorophore under inspection. The brightness and brilliance of images are dictated by the minimum transmission percentage of the filter. The ideal transmission being >85%. The Dichroic mirror (beamsplitter): The Dichroic mirror or beamsplitter is placed at an angle of 45° between the excitation filter and emission filter. The function of a dichroic filter is to reflect the excitation signal towards the fluorophore and to transmit the emission signal towards the detector. Emission filter: The emission filter is located within the imaging path of a fluorescence microscope. Its job is to filter out the entire excitation range and to transmit the emission range of the fluorophore under inspection. Objective lens: The purpose of the objective lens is to transmit light to the sample to form the image. The light passes down through the dichroic mirror before reaching the objective lens. Camera system: A camera system helps to record the images of the specimen with high-resolution. CCD (Charge Coupled Device) cameras are often used in the system. These electron multiplying cameras are good at imaging single photon events without loss of sensitivity. They do not require an image intensifier, and images can be captured at high speed. A fluorescence microscope works by combining the magnifying properties of the light microscope with fluorescence emitting properties of compounds. Fluorescence microscopy uses a high-intensity light source that excites a fluorescent molecule called a fluorophore in the sample observed. The samples are labeled with fluorophore where they absorb the high-intensity light from the source and emit a lower energy light of longer wavelength. The resulting fluorescent light is then separated from the surrounding radiation with filters, allowing the observer to see only the fluorescing material. The resulting image is a magnified version of the specimen that is studied. A majority of the fluorescence microscopes used in biology today are epi-fluorescence microscopes. Both the excitation and the observation of the fluorescence occur above the sample. What Are Fluorescence Microscopes Used For? Fluorescence microscopy finds use in biology, biomedical and material sciences. The unique functionality of fluorescence microscopes helps identify cells and sub-microscopic cellular components with accuracy and details. Fluorescence microscopy uses are widely used in the field of histochemistry to detect particles such as neurotransmitter amines which cannot be seen by conventional microscopes. It is used in food chemistry to assess the presence, structural organization and spatial distribution of specific food components in a product. Another use of fluorescence imaging is Fluorescence Speckle Microscopy. It is a technology that uses fluorescence labeled macromolecular assemblies such as cytoskeletal protein to study movement and turnover rates. Fluorescence microscopy staining also is helpful in the field of mineralogical applications. It is routinely used for the study of minerals such as coal, graphene oxide and more. It is also widely used in the textile industry to analyze fiber dimensions. Epifluorescence microscopy helps to study the fiber-based materials including paper and textiles. Fluorescence microscopy is ideal for studies of porosity in ceramics, using a fluorescent dye. It is also applicable to studies of semiconductors. « What is a Digital Microscope?